As a fully equipped licensed disaster restoration general contractor, we can rebuild your home or building from the ground up. Our professionals can coordinate the entire reconstruction process, ensuring the timely completion of the projects. Our disaster restoration management team and field supervisors have years of disaster restoration experience, so you can feel comfortable leaving the rebuilding in our competent and caring hands. Please contact us for a complete list of our reconstruction services. ServiceMaster Clean has led the carpet cleaning industry in customer satisfaction for over 65 years. We have the experience and ability to meet all your carpet cleaning maintenance requirements. Whether it be an annual cleaning or ongoing, programmed maintenance, our carpet cleaning process will ensure the highest standards for cleanliness and longevity for the lifespan of your carpet. Ice dams occur when heavy snow buildup melts during the day and then refreezes when temperatures fall overnight. After several days of the thaw-freeze cycle, it is common for the ice to work up under the shingles. 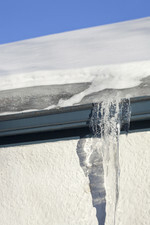 This is when your roof becomes vulnerable as that ice begins to melt and causes a leak. This leak can potentially damage your ceiling, walls and the contents of your home or business. Whether you require preventative maintenance or damage restoration, you can count on us to provide prompt and reliable service. We offer the complete Fireline system including ~ Pre-wash station, Ultrasonic processor, Rinse detail station and Drying chamber for precision contents cleaning. All content cleaning is handled in house in our 1150sq ft self contained cleaning room by our trained certified technicians. This system is designed to eliminate the inefficiences associated with standard contents cleaning methods. It allows us to increase productivity while decreasing the number of non-salvagable items to be disposed of. The Odell Electronics Cleaning Station provides effective step by step electronics cleaning procedures that produce consistent failsafe results.